“It’s OK to Talk about SUICIDE”. Talk and Interactive Session on how to help those in Acute Distress. Suicide is a growing epidemic in many countries worldwide and Singapore is no exception. Economic, societal, medical and personal stress factors such as unemployment, debt, loneliness, depression, substance addiction and relationship issues can all be triggers to push a person over the edge. Strong family and community support during key moments can play a vital role in mitigating suicide risk. 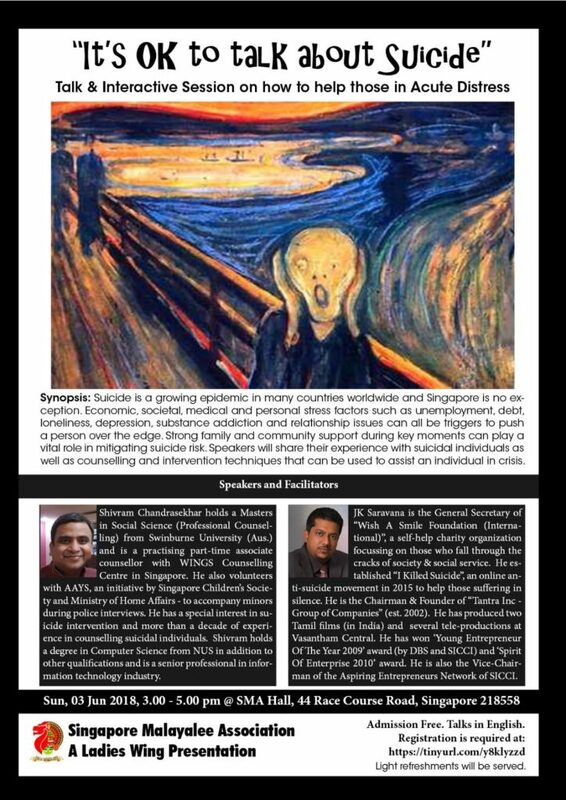 Speakers will share their experience with suicidal clients as well as counselling and intervention techniques that can be used to assist an individual in crisis. 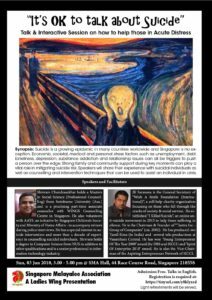 Shivram Chandrasekhar holds a Master of Social Science (Professional Counselling) degree from Swinburne University, Australia and is a practising part-time associate counsellor with WINGS Counselling Centre in Singapore. He also volunteers with AAYS, an initiative by Singapore Children’s Society and Ministry of Home Affairs – to accompany minors during police interviews. He has a special interest in suicide intervention and more than a decade of experience in counselling suicidal individuals. While counselling is his passion, his actual career is in information technology. Working from Singapore for over 20 years, he has architected complex software solutions and led teams implementing contact centre technologies across twelve countries. He is currently Head, Projects at Remego Pte Ltd., a Singapore based startup. Shivram holds a Bachelor of Science degree (Computer Science & Information Systems) and a Graduate Diploma in Software Engineering from the National University of Singapore, and a Specialist Diploma in Network Security from Singapore Polytechnic. JK Saravana is the general secretary of Wish A Smile Foundation (International), a self-help charity organization (est 2014) that reaches out to help Individuals and families globally. The organization mainly focuses on those who fall through the cracks of society & on social service. He established “I Killed Suicide”, an online anti-suicide movement in 2015 to help those suffering in silence. This movement has since been adopted by Wish A Smile Foundation and has expanded island wide. JK Saravana is also the Vice-Chairman of the Aspiring Entrepreneurs Network of the Singapore Indian Chamber of Commerce and Industry (SICCI). He is the Chairman& Founder of the International Entertainment Powerhouse, Tantra Inc –Group of companies (est 2002) in Singapore. He is recipient of the prestigious ‘Young Entrepreneur of the year 2009’ awarded by DBS Bank and SICCI and also ‘SPIRIT OF ENTERPRISE 2010’ award for Entrepreneurship.